Twitter recently introduced a new section to its analytics dashboard which allows brands and advertisers to track the number of links to their website that are posted to its service, Marketing Land reports. 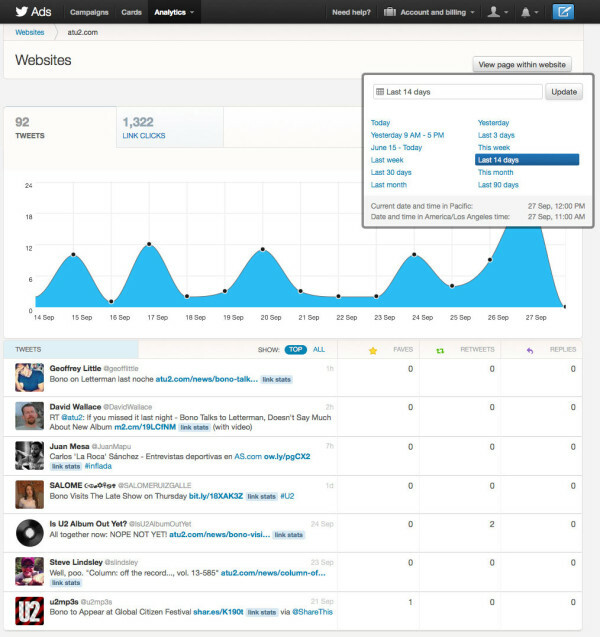 The new ‘Websites’ section can be configured to track for a specific domain to show the number of tweets and click-throughs that Twitter is generating for the site as a whole or specific pages. Webmasters simply add a line of code to their site, in the same way that a Google Analytics tracker work. Obviously there are existing social and publisher dashboards and services that present similar data — to help show traffic from Twitter and other social platforms — but this adds further strength to Twitter’s own ad dashboard, which got a big makeover in June. It’s not immediately clear when the ‘Websites’ feature was added, however. Read next: This extension has transformed my Chrome & computer experience. Highly recommend you try it now.